ARCHANGELS is a company based in God's Country (beautiful sunny Southern California), dealing in Rare and Unique Paper Collectibles. We specialize in vintage Comic Books, Original Comic Book Artwork, Hollywood Movie Posters and other related items as well. We are Senior Advisors to the Overstreet Comic Book Price Guide and a Charter Member Dealer with the Comics Guaranty, LLC (CGC). For other wonderful items, make sure to visit us at our About Me Page. New Avengers Marvel Promotional Banner Art by Mike Deodato Jr. 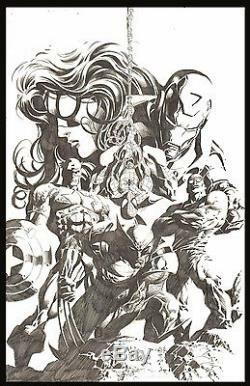 Very cool promotional original artwork of the New Avengers done for Marvel Comics by fan favorite artist Mike Deodato Jr. This superb image features such legendary characters as the Amazing Spider-Man, Captain America, the Invincible Iron Man, Spider-Woman, Luke Cage and Wolverine in the very forefront. The artwork appeared on large printed banners at various comic book conventions all across the country. Deodato himself stated, It was a promo image for when I started doing Avengers with Bendis. Marvel used it for advertising. I remember seeing it in a giant banner at the Marvel booth in a convention I was participating back then. Did it while waiting for a new ASM script. There is likewise an inked version of this image, but the piece offered here are the original pencils. The inked version was done using a lightbox of the pencils. Deodato further explained, I sent that Avengers illo to [Tom] Brevoort and he told me to ink it so they could use it somewhere. Artwork in is like-new condition. Wall-to-wall artwork with image size measuring approx. Signed by Mike Deodato Jr. The item "New Avengers Marvel Promotional Banner Art by Mike Deodato Jr Wolverine Cap" is in sale since Monday, January 16, 2017. This item is in the category "Collectibles\Comics\Original Comic Art\Other Original Comic Art". The seller is "water-walker" and is located in San Diego, California. This item can be shipped to North, South, or Latin America, all countries in Europe, Japan, Australia.